12 FT. X 20 FT. - This lovely suite is a cheery and soothing room and overlooks the beautiful gazebo area, the grounds and the flower and rock garden. Also the view out into the quarterhorse pasture is really pretty. 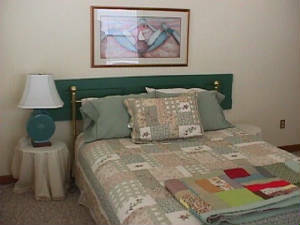 The room offers privacy and has a king sized bed and private Jacuzzi tub in it's beautiful bath. Rates: $125.00 Plus Tax for 2 people, $25 for each additional person. $50 non-refundable deposit. ONE KING BED LOCATED IN SPRING LYNN SUITE. VIEW OF GAZEBO AREA FROM WINDOW OF SPRING LYNN SUITE.